Diane Ravitch was kind enough to send me and a number of my fellow education bloggers an advance copy of her outstanding new book, "Reign of Error: The Hoax of the Privatization Movement and the Danger to America's Public Schools". My review of the book should appear shortly in another, far larger venue under my real name. merit pay, and many others. Readers of this blog will likely delight in a chapter dedicated to the self-aggrandizing Michelle Rhee. Ms. Ravitch dubs her the "face of corporate reform" and then proceeds to slap that face with a broad hand. She exposes Rhee's deceptions about her alleged test score triumphs and the devastation wreaked by Rhee's IMPACT teacher evaluation system. Perhaps even more important than her expose of the reformers themselves, Ravitch points the way forward. 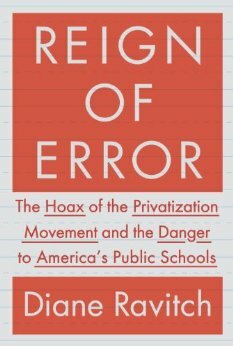 She devotes 100 pages to proposed solutions to what ails public schools, all of which make perfect sense. From pre-natal care to wraparound services, Ms. Ravitch offers common sense solutions that move us away from the blame game so beloved by reformers. She clearly sees teachers as part of the solution, rather than the problem. I love the fact that his book is coming out at the same time that Bill de Blasio seems poised to become mayor of NYC as the "anti-Bloomberg". It may just be that the pendulum, which has so long swung towards the reformers, may at last be swinging its way back to teachers, students, parents, and other real stakeholders in the education system. If the reform movement sputters and dies, as most teachers hope it will, we will have no one to thank more than Ms. Ravitch, who has stood up for teachers when most others, including so called democrats such as Obama, have willingly abandoned us in favor of the elite. You should buy her book, read her blog, and thank your lucky stars that someone of her stature is on our side and the side of the children we teach.